The Ecological Chemistry 2005 is the third conference in this field which will be held in the Republic of Moldova that marks the growing national and international interest for the exchange of scientific information among scientists and engineers in this rapidly growing area of research and applications. The Conference will aim to communicate recent advances in the overall research of ecological chemistry of water, air and soil. The importance of this Conference cannot be over-emphasized as these natural components increasingly become precious resources on which the well-being of future generations depends. Issues of water and air quality, prevention of soils contamination, sustainable environmental policy and legislation are essential to the future of the world population. The Ecological Chemistry 2005 is recognized as one of the important international conferences, which attracts scientists and engineers from the Former Soviet Union States, Europe, U.S.A. and other countries. Ecological Chemistry started to develop in Moldova when the First International Ecological Chemistry School was conducted in 1985. For almost 20 years this field is intensively expanding being one of the priorities for the sustainable development of the National Economy. 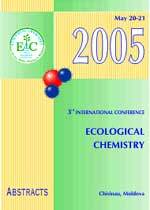 The Ecological Chemistry 2005 is part of a series of successful conferences organized up to present.